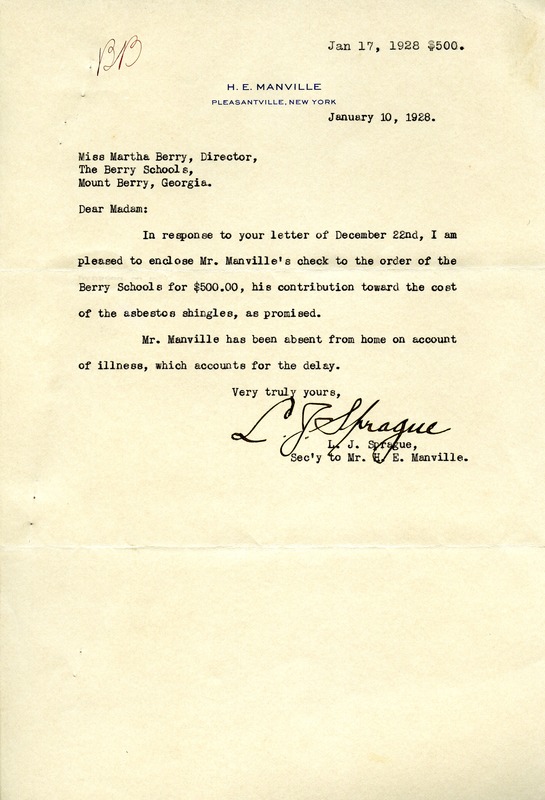 This letter was written by L. J. Sprague on behalf of H. E. Manville to Miss Berry. Mr. Manville generously donated $500.00 to the school to go toward the cost of asbestos shingles. L. J. Sprague explains that the letter was delayed because Mr. Manville had been ill.
L. J. Sprague, “Letter to Martha Berry from H.E. Manville.” Martha Berry Digital Archive. Eds. Schlitz, Stephanie A., Rachel Renaud, Hannah Bailey, et al. Mount Berry: Berry College, 2012. accessed April 24, 2019, https://mbda.berry.edu/items/show/8362.